Nursing: Its Principles And Practices; Robb, Isabel Adams, Mrs.; W.B.Saunders, Philadelphia, 1898. Lynch Ryan’s very first client was a Massachusetts Community Hospital where the Experience Modification Factor was 2.77, primarily due to nursing and nursing assistant back injuries. The year was 1984, eighty-six years after Mrs. Robb’s observation, quoted above, and the Hospital had two problems: What to do about the employees who were suffering the back injuries and how to prevent them from happening in the future. Pulling a good-sized rabbit out of a small-sized hat, we were spectacularly successful at solving the first problem and pathetic failures when it came to the second. Oh, we knew what should be done. We had grand plans, but execution was beyond all our best efforts. And the problem continues to this day with no end in sight. Many nurses and nursing assistants were themselves overweight or obese and, consequently, even more unable to lift overweight or obese patients. Today, in addition to the weight issue, which still remains (a 2012 University of Maryland study found 55% of nurses to be obese), the average age of nurses is higher than it was in the 1980s, and, because of budget constraints, there are fewer of them per patient. While back injuries are the greatest source of loss with respect to nurses, the situation is even more problematic for nursing assistants, as this chart from the Bureau of Labor Statistics (BLS) shows. As you can see, nursing assistants suffer more back injuries than any other occupation. And as America continues to age – baby boomers turn 65 at the rate of one every nine seconds – the problem is only going to get worse. This horrendoma that nobody seems to want to address is so severe that injuries in the health care sector dwarf any other industry, as another BLS chart shows for 2016, the most recent year for which there is data. As we careen, helter skelter, down the Make America Great Again pothole-pockmarked highway, you’d think some genius would finally figure out how to fix the problem Mrs. Robb identified back in 1898. Then again, maybe not. Do you know anyone who works as a Personal Care Aide or a Home Health Aide? Has anyone in your immediate family, now or in the last 10 years, been taken care of by a Personal Care Aide or a Home Health Aide? Do you personally know anyone who now or in the last year employed the services of a Personal Care Aide or a Home Health Aide? I like my odds. 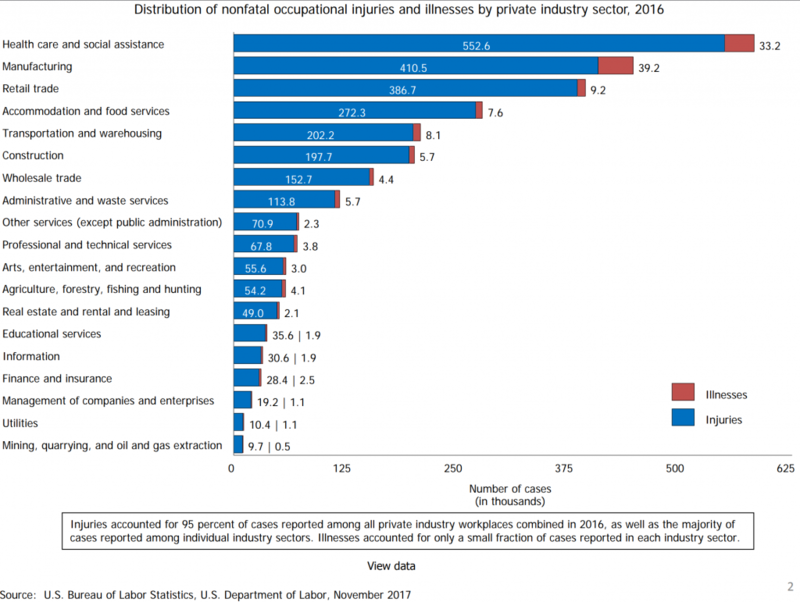 According to the Bureau of Labor Statistics, six of the ten fastest growing occupations from 2012 to 2022 will be in the health care industry and numbers two and three on the list are – you guessed it – Personal Care Aides and Home Health Aides, growing by 49% and 48%, respectively, closely following Industrial-Organizational Psychologists, a profession that is expected to grow by 53% during the ten year period. While Psychologists are projected to have the greatest rate of growth, they’ll only be adding about 900 jobs to the economy. This is dwarfed by the numbers of new jobs for the Aides, 581 thousand and 424 thousand, respectively. Taken together, they’ll be adding more than a million workers to the economy. A hefty number, indeed. The Occupational Safety and Health Administration (OSHA) announced a new National Emphasis Program (NEP) to focus outreach efforts and inspections on specific hazards in nursing and personal care facilities with high injury and illness rates. Only one problem with that: It was written exactly 13 years ago this month! Non-fatal injuries to health care workers requiring days away from work are on the rise, according to new data from the Bureau of Labor Statistics released Nov. 9, and OSHA Administrator Dr. David Michaels has vowed to launch a National Emphasis Program on Nursing Home and Residential Care Facilities. “It is unacceptable that the workers who have dedicated their lives to caring for our loved ones when they are sick are the very same workers who face the highest risk of work-related injury and illness,” said Michaels. According to BLS, the incidence rate for health care support workers increased 6 percent to 283 cases per 10,000 full-time workers, almost 2.5 times the rate for all private and public sector workers (emphasis added) at 118 cases per 10,000 full-time workers. The rate among nursing aides, orderlies and attendants rose 7 percent, to 489 per 10,000 workers. 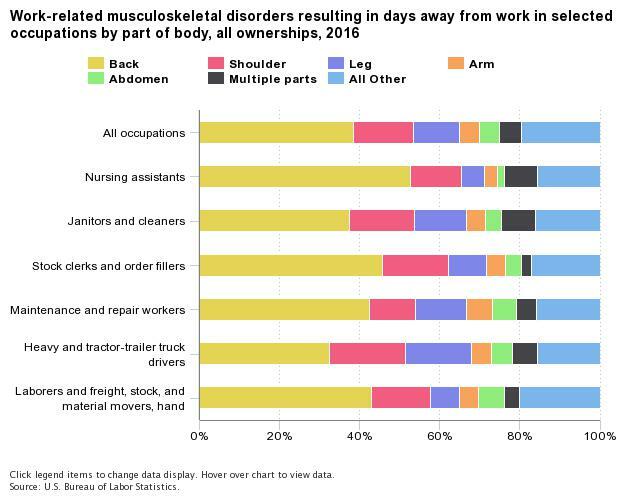 Additionally, the rate of musculoskeletal disorder cases with days away from work for nursing aides, orderlies and attendants increased 10 percent to a rate of 249 cases per 10,000 workers. “The rates of injuries and illnesses among hospital and health care workers underscore OSHA’s concern about the safety and health of these workers,” said Michaels. That was written by OSHA in November, 2011. ¹ And this rate of injury does not include the thousands of Aides who are hired to take care of Grandpa and Grandma in the home and who are paid minimum wage. Muscular Skeletal (MS) injuries to nurses and nursing aides have become an epidemic in America. At least, according to the American Society of Safety Engineers (ASSE) recent Safety Culture in Healthcare, The $13 Billion Case, a peer-reviewed feature in the October issue of Professional Safety, the Society’s journal . The article’s author, Scott Harris, Ph. D., MSPH, says, “Pick any other industry, and the injury rate is less.” And he’s pretty much right. Patient handling is the driver. According to NIOSH (National Institute for Occupational Safety & Health), the most a nurse or aide in the 90th percentile of strength should lift at any one time is 46 pounds. But a typical 8-hour workday in this field involves lifting about 1.8 tons. Twelve percent of registered nurses who quit the field report that they do so because of back pain due to patient handling. This resonates with me. Lynch Ryan opened its doors in 1984. Our very first paying client was a community hospital, where patient handling injuries had caused the hospital’s experience modification factor to balloon to 2.77. Working with the nursing staff and Human Resources VP, we were able to introduce necessary management policies and procedures as well as a sophisticated modified duty program that cut workers comp losses by more than 80%. However, the muscular skeletal injuries kept happening, because patients kept having to be moved. So, the hospital bought two Hoya Lifts – yes, there were Hoya Lifts in 1984. Getting staff to use the Hoya Lifts was an entirely different problem. It was actually harder than creating and systematizing the modified duty program, because using the lifts significantly increased the time it took to move the patient, and one thing nursing staff didn’t have a lot of, and still don’t, was time. Instituting the new patient handling protocols involved a lot of training. We had to create rules, procedures, metrics and accountability. Even so, it was incredibly difficult. Over the year’s we’ve worked successfully for more than 120 hospitals, from tertiary care systems to single site community hospitals. But regardless of how much we’re able to help reduce workers comp loss costs, the patient handling problem never goes away. Now, nearly thirty years from that first engagement, the only thing that seems to have changed is that the problem has become more dire, turning into an industrial many-head Hydra. It’s the same with registered nurses where, oftentimes, the shortage is self-inflicted. A study of 21 hospitals in the Twin Cities found that when registered nursing positions were decreased by 9%, work-related illnesses and injuries among nurses increased by 65% (Trinkoff, et al., 2005). Nonetheless, the BLS reports that between 2010 and 2020 the fastest growing occupation in America will be Registered Nursing (HHAs and CNAs follow close behind). The need is an additional 1.2 million nurses. In 2011 one out of every five new jobs created in America was in Healthcare. We should be graduating 30% more nurses than we are per year. But a shortage of nursing faculty prevents nursing schools from expanding to accommodate the demand. In 2011, nearly 76, 000 otherwise qualified candidates were turned away by nursing schools. This means that there will be fewer nurses and aides to go around at a time when hospital populations are growing much larger (both in numbers and size), meaning that the stresses involving patient handling will continue to intensify. Patient handling injuries account for 53% of healthcare workers compensation loss costs. The mean average costs are five times higher for injured employees over the age of 45 than for those under the age of 25. Muscular skeletal losses per full time equivalent are well over $300, regardless of age. I asked Rick Graham about this. Rick is Corporate Director, Insurance & Risk Control for Crozer Keystone Healthcare System in Delaware County, PA, and a Lynch Ryan client. Patient handling bedevils Crozer Keystone in general and Rick in particular. Crozer, like many hospital systems has been wrestling with the issue for decades. Through Rick’s efforts, the system has introduced a number of initiatives to deal with the issue, and, while many have proven somewhat successful, the problem remains. Rick now concludes that the only answer is to remove the people factor from the lift factor. He also realizes that having lifting equipment built into every patient room is the only way to significantly increase patient handling protocol compliance. The system has done this in an acute care setting and has seen a significant decrease in injuries and costs. It’s the simplest solution, but the costliest. Trained lift teams could work (they’ve been shown to in one California hospital study dating from 1997), but lift team members get hurt, too, and they present logistical difficulties. Rick estimates that the ROI from installing the equipment is two years, but the budget issue is still daunting. The bottom line is this: As Crozer Keystone is demonstrating, the healthcare industry, confronted with a tsunami of personnel, safety and workers comp issues, has got to begin – finally – to meet these challenges with the resources necessary to overcome them. Anything less will send healthcare in America to a far worse place than the rocky place it now inhabits. Taking care of business – At WorkCompWire, Joe Paduda poses the question What business are you in?” He hazards a guess that most of us would say “the insurance business” but he argues that we are really in “the medical and disability management business – with medical listed first in order of priority.” He suggests that, “Senior management misunderstands their core deliverable – they think it is providing financial protection from industrial accidents, when in reality it is preventing losses and delivering quality medical care designed to return injured workers to maximum functionality.” We could quote the whole thing, he makes a compelling argument so be sure to check it out. It echoes one of the Lynch Ryan founding tenets. When many of us got into this business, we did not come with insurance backgrounds. We felt at its core, managing injuries required a focus on the human event and not the dollars. We believed then and still believe now that if you took excellent care of the injured worker, got them quality medical care and helped them get well and back to work, the dollars would follow. Smile – it’s March 20 – Did you know that March 20 is International Day of Happiness? Now you do. It’s also the first day or Spring, and if, like us, you wondered why Spring isn’t commencing on the usual March 21 date, Joe Rao at SPACE.com explains Why Spring Begins Early This Year. New Citizenship Verification form – As of 3-8-13, a revised US Citizenship & Immigration Service (USCIS) Verification Form I-9 has been issued. There is a 60-day grace period to come into compliance – new USCIS I-9 Formsforms must be in use by May 7, 2013. Now, a new research report from Maine offers a close-up snapshot of the issue of workplace violence as it relates to caregivers. The Research and Statistics Unit of the Maine Department of Labor compiled data from First Reports of Injury for 2011 and issued a report on 2011 Violence Against Caregivers in Maine. The report encompassed about 100,000 workers in healthcare and affiliated professions. Of the nearly 10,000 thousand injuries reported by those workers, 13.4% were related to violent and aggressive acts by patients and care recipients. Where incidents occurred – Mental health care settings and other residential care facilities accounted for 52% of all violent/aggressive incidents in 2011. These were followed by nursing care facilities for the elderly and people with disabilities, 18.9%, and general medical and surgical hospitals and services, 16.8%. What types of jobs were involved – Nurses at all levels (including nursing assistants) were involved in 21.27% of the cases; education technicians were involved in 18.6% cases; direct support professionals (personal care, hygiene, life skills, etc) were involved in 9.4% cases; Other occupations with significant numbers of cases included psychiatric technicians, behavioral health technicians and analysts, mental health and social workers and child care and senior child care workers. What types of assaults occurred – The most prevalent type of assault – being hit – accounted for 21.3% of all incidents. Bites were the second highest reports, at 16.6%, of the incidents. Other identifiable assault categories included kicks, 9.45%, and being grabbed, 9.4%. Due to the high number of bite incidents, a specific section of the report focuses on bite injuries and references information from the Federal Bureau of Prisons’ 2009 Clinical Guidelines regarding viral and bacterial exposures and the potential for infections if the skin is broken. The report also cites NIOSH publications and reports, including common risk factors for violence and a list of potential prevention strategies. The full report is available in PDF: Maine’s Caregivers, Social Assistance and Disability Rehabilitation Workers Injured by Violence and Aggression in the Workplace in 2011. According to the U.S. Bureau of Labor Statistics, nursing and residential care facilities experienced some of the highest rates of lost workdays due to injuries and illnesses. In response to this, OSHA has announced a new National Emphasis Program for Nursing and Residential Care Facilities to protect workers from serious safety and health hazards that are common in medical industries. These hazards include exposure to blood and other potentially infectious material; exposure to other communicable diseases such as tuberculosis; ergonomic stressors related to lifting patients; workplace violence; slips, trips and falls, and exposure to hazardous chemicals and drugs. See OSHA’s complete directive PDF). According to the American Nurses Association, 12% of nurses leave the profession due to back pain. Nursing is one of the top 10 most hazardous jobs for injuries to muscles and joints. Many heavy labor industrial jobs have weight lifting limits of 50 pounds, yet nurses routinely bear many times that weight when transferring, repositioning or lifting patients. Nursing home workers in particular are at higher risk of injury than underground coal miners, construction workers, and tire manufacturers. Of the 16 million US workers employed in health care and social assistance, more than 3 million are employed in US nursing and residential care facilities. More recently, further evidence was released via a study by NCCI: Safe Lifting Programs at Long-Term Care Facilities and Their Impact on Workers Compensation Costs (PDF). The study was a collaborative effort with the University of Maryland School of Medicine. It was limited to facilities that have had safe lift programs in place for more than three years. Originally, researches intended to compare the experience of facilities with and without such programs, but during the course of the research, the rate of adoption of safe lifting devices was so great that close to 95% of facilities had them and about 80% of those used them regularly. According to the earlier NIOSH study, training alone is ineffective as a prevention strategy because “lifting the weight of adult patients is intrinsically unsafe.” It’s also important to note that the equipment alone won’t do it – workers also need to be trained how to use the equipment and management must implement and enforce a “zero lifting” policy. In recent years, a number of states have enacted legislation mandating safe patient lifting – and that no doubt has contributed to the rapid adoption rate noted by NCCI researchers. According to the American Nursing Association, a strong advocate for such legislation, 10 states have implemented safe patient handling laws. These include California, Illinois, Maryland, Minnesota, New Jersey, New York, Ohio, Rhode Island, Texas, and Washington, with a resolution from Hawaii. In addition, they are tracking 6 states with pending legislation currently: California, Illinois, Maine, Massachusetts, Missouri and Vermont. Sometimes, system redress seems painfully inadequate. Such is the case with the $7,000 OSHA penalty recently imposed for inadequate safeguards related to the case of murdered mental-health worker Stephanie Moulton. $7,000 is the maximum fine available for “a serious violation of the agency’s “general duty clause” for failing to provide a workplace free from recognized hazards likely to cause serious injury or death.” It’s not just that the dollar amount seems paltry in light of the loss of life – it simply doesn’t seem substantial enough to have any deterrent value. And in truth, while the OSHA citation points to the employer, one could make the case that the employer is also a victim of an economic squeeze play, which has resulted in inadequate staffing and safety controls. State budget cutbacks worry mental health workers – a scenario that is no doubt playing out throughout the country – in mental health budgets, in public safety budgets, and in regulatory enforcement, just to name a few areas that affect the health and safety of workers — and of the public. Stephanie Moulton was working alone at one of the North Suffolk Mental Health Association’s group homes in Revere when she was brutally murdered by a patient with a violent record. A week later and just miles away at the Lowell Transitional Living Center, a shelter for the homeless, a worker named Jose Roldan was also killed by person who had slipped through the cracks in the mental health system. Both these murders were discussed in-depth in stories that appeared in The New York Times: A Schizophrenic, a Slain Worker, Troubling Questions recounted Moulton’s death, and Teenager’s Path and a Killing Put Spotlight on Mental Care discussed the case related to Roldan’s death. Creating a stand-alone written workplace violence prevention program that includes implementation of workplace controls and prevention strategies; hazard/threat/security assessments; a workplace violence policy statement outlining and emphasizing a zero tolerance policy for workplace violence; incident reporting and investigation; and periodic review of the prevention program. Establishing a system to identify clients with assaultive behavior problems and train all staff to understand the system used. Putting in place procedures to communicate any incident to staff so that employees without access to client charts are aware of previous violent or aggressive acts by a client. Identifying the behavioral history of new or transferred clients, including conducting criminal and sexual offender records checks. Conducting more extensive training so that all employees are aware of the facility’s workplace violence policy and where information about it can be found, including training employees to clearly state to clients that violence is not permitted or tolerated; how to respond during a workplace violence incident; recognize when individuals are exhibiting aggressive behavior and how to de-escalate the behavior; and identify risk factors that can cause or contribute to assault. Installing and positioning panic buttons, walkie-talkies, recording security camera systems and smart phone GPS applications to better monitor employee safety and increase staff communication and support; implement and maintain a buddy system on at least the second and third shifts, based on a complete hazard assessment. Mouton’s family is rallying for enactment of Stephanie’s law, which would mandate panic buttons in mental health facilities. A good start and one among recommendations issued by OSHA in their Guidelines for Preventing Workplace Violence for Health Care & Social Service Workers. But such measures may be woefully inadequate in the face of reduced staffing. In an ongoing climate of budget cuts and a strong public appetite for decreased regulatory controls, mental health workers are likely to continue being at greater risk — along with public safety workers such as police, firefighters, and healthcare workers, who also face dire staffing shortages. Are nurses and health care workers facing more on-the-job violence? If you asked the average person to list professions with the highest rates of violent assault, few would put health care professionals high up on that list. But the reality is that when it comes to workplace violence, nurses, nursing aids, and paramedics have the dubious distinction of being very high up on the list; only police and correctional officers suffer a higher rate of on-the-job assaults. And many nurses say that the violence is only getting worse. Health care workers are more likely to be attacked at work than prison guards or police officers. Nurses are the health care workers most at risk, with female nurses considered the most vulnerable. General patient rooms have replaced psychiatric units at the second most frequent area for assaults. Physical assault is almost exclusively perpetrated by patients. 97% of nurse respondents to a UK survey knew a nurse who had been physically assaulted during the past year. 72% of nurses don’t feel safe from assault in their workplace. Up to 95% of nurses reported having been bullied at work. Up to 75% of nurses reported having been subjected to sexual harassment at work. Last fall, the issue of safety for nurses and allied health professional was brought to the forefront after the deaths of two California healthcare workers in separate incidents. In October, psychiatric technician Donna Gross was strangled to death and robbed at Napa State Hospital. Days later, nurse Cynthia Barraca Palomata died after being assaulted by an inmate at Contra Costa County’s correctional facility in Martinez. The deaths have sparked a new push for better security and stronger worker safeguards, particularly in settings treating prisoners and psychiatric patients. While the occupational danger in environments like prisons and psychiatric hospitals is recognized and real, these are hardly the only high-hazard settings in which nurses work. Hospital emergency rooms are widely recognized as a hazardous environment, but violence occurs in other wards, too. Last year, the Well, a NY Times healthcare blog, featured an article by RN Theresa Brown entitled Violence on the Oncology Ward. And the CDC recently spotlighted research focusing on an increase in assaults on nursing assistants in nursing homes. In that study, 35% of nursing assistants reported physical injuries resulting from aggression by residents, and 12% reported experiencing a human bite during the year before the interview. There are no healthcare settings that are immune. Assaults routinely occur in general hospitals, in health clinics, and in patients’ homes. The perpetrators of violence are varied: While many assaults are by patients, friend and family members of patients also can commit the assaults. There are also rapists or muggers who are targeting healthcare settings or solitary workers; drug addicts and robbers, who are looking for medications; and domestic violence brought into the workplace. And it’s unclear why violence is on the rise. Many point to staff shortages. Others see the preponderance of alcohol, drugs, and ready access to weapons as contributing factors; others think that hospital administrators do too little in the area of prevention. In HealthLeaders Media, John Commins discusses an innovative approach undertaken by the University of Wisconsin Hospital and Clinics – a program to codify risk of hospital violence. Recently, the Emergency Nurses Association issued a Workplace Violence Toolkit, targeted specifically at emergency department managers or designated team leaders. Posted in Safety & Health | Comments Off on Are nurses and health care workers facing more on-the-job violence? The first is a feel-good clip performed by staff at Providence St. Vincent Medical Center in Portland, Oregon to raise awareness for breast cancer. The next clip is a Gilbert & Sullivan parody created by the Neuroscience Education Institute to be a little video played at the beginning of lectures presented by Dr. Stephen Stahl. The third clip is performed by the Laryngospasms, a group of practicing Certified Registered Nurse Anesthetists who create and perform medical parodies for audiences throughout the United States. The Colorectal Surgeon Song – OK, this is not performed by actual medical folk, but well worth a listen anyway! UAB Emergency Room Tap – created by ER nurses for a National Nurses’ Week contest and celebration. UAB nurses and other staff members are featured in the video. Footloose: Nursing School Style – Baylor Louis Herrington School of Nursing cuts footloose.